Thames Tradesmen leading Leander in the final of the Grand. Photo: Rowing August 1976. As HTBS readers know by now, YouTube is a real treasure trove when it comes to film clips on rowing. HTBS’s Tim Koch found two wonderful films from the 1976 Henley Royal Regatta on YouTube. HTBS asked rowing historian Christopher Dodd to write a commentary about Henley for that year. As many of you are aware of, Dodd is an authority on British rowing and he paid special attention to the country’s rowing progress during the 1970s in his book Pieces of Eight: Bob Janousek and his Olympians (2012). The open events were devoid of national crews, including the entire British team, who were in Canada preparing for the Montreal Olympics. Britain’s best hopes for medals that summer were the men’s eight, hand-picked three years before by Bob Janousek, the national coach, and the double scullers Chris Baillieu and Mike Hart. The eight’s last pre-Olympic regatta was Lucerne, held before Henley that year, and there was no opportunity to thrill the home crowd at Henley. So the open events were short of class if not of competition. Janousek’s eight was a blend of Leander Club and Thames Tradesmen, and it was these two clubs who finished up contesting the Grand. Both contained men who had missed Olympic selection. Leander reached the final by beating the University of British Columbia (three quarter length) followed by London University (half length). Tradesmen arrived there by beating London RC by a third of a length. London were effectively the national lightweight eight (no Olympic lightweight events in 1976). 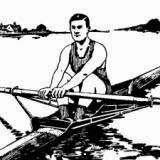 London University were coxed by John Boultbee, who later became the first Australian to be elected a Henley Steward. As the clip shows, Tradesmen won a close final by two thirds of a length. This was the second attempt after a re-row was ordered by the umpire after Leander stopped at the top of the Island during the first attempt when their rudder hit a submerged object. The race was re-scheduled for 4.15 p.m. (three and a quarter hours after the first start), and Tradesmen went out to three quarters of a length at Fawley and saw off Leander’s attempts to get even. Thames Tradesmen: Mallin, K. Cusack, Burch, Wilson, Bayles, Roberts, Milligan, Brown, cox Sherman. Leander: D. and G. Innes, Tatton, Hardingham, King, Woodward-Fisher, Gregory, Rankine, cox Lee. The commentaries on these clips are by Jim Railton, the rowing correspondent of The Times, who had been the ARA’s trainer in the late 1960s and who, a sprinter by sport, had blooded himself in rowing as a volunteer coach at Tradesmen. Railton has a comfortable, warm voice with a trace of his Liverpudlian origin, and he doesn’t make mistakes. 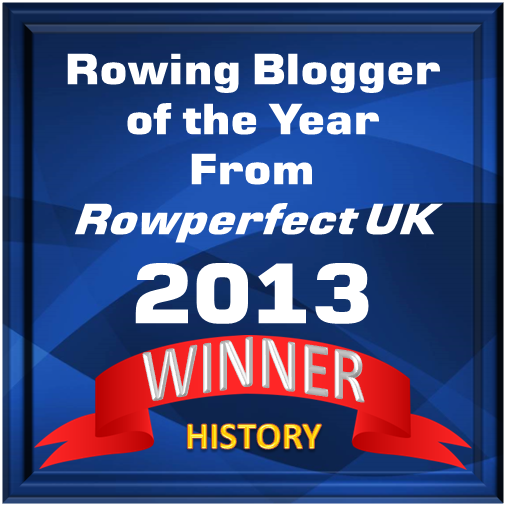 But his performance highlights the problems of commentating on rowing and filming on the Henley course. He is caught between the producers’ paranoia of silence breaking out even when the viewer can see what is happening, and the commentator’s paucity of information. Although he had coached some of these men – producing a famous ‘Beatle’ four of Mason, Clark, Robertson and Smallbone who morphed into Janousek’s Olympic squad – Railton doesn’t furnish us with their record, past performance or personal history. Added to which, he’s talking to a monitor in a trailer somewhere. It’s unfair to throw all the blame for lack lustre at him. The same challenges face the Stewards today as they seriously consider getting the tv cameras in. The Thames Cup in 1976 was electric because the local club, Henley RC, were on the brink of winning their first Henley medal. They beat Saxon, Vesta, Rollins College and the selected University of Pennsylvania to reach a final against Harvard. Their race with Penn was hairy because Henley lost an oar from a rowlock on the 18th stroke, but recovered to take the lead. A year before, Harvard had lost the first round of the Thames to Garda Siochana, the Irish police, who went on to win the cup. 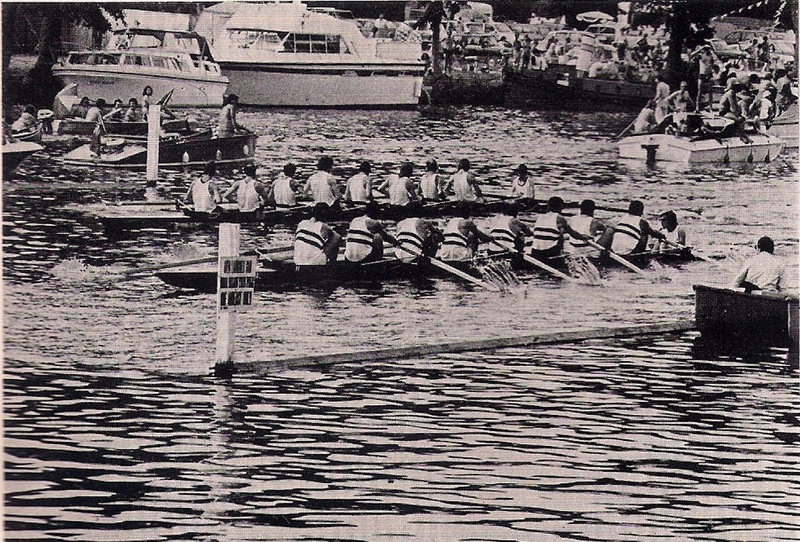 It was the first time Harvard had lost in the Thames, and in 1976 they were keen to recover their record. They were selected and reached the final by way of wins over Molesey, Imperial College, Hansa Dortmund and Christiania of Norway. The final was a cracker. Henley had a canvas at the quarter mile signal and kept it to the Barrier and stretched it to a third of a length at Fawley, over-rating Harvard. Then Harvard drew level at the three quarter signal. Henley rose to 41 and Harvard to 43 to bring the latter home first by a canvas. Harvard: McGee, Templeton, Wood, Moore, Wiley, Perkins, Porter, Gardiner, cox You. Henley RC: Maffre, Bushnell, Smith, Allen, Marsden, Pankhurst, Glenn, Richardson, cox Woodford. After Hansa Dortmund withdrew, the Stewards’ was a straight final between University of British Columbia and Thames Tradesmen. Both crews had also rowed in the Grand, with Tradesmen having covered extra mileage that day because of the Grand re-row. The Canadians took the lead off the start and had a length and a half at the mile. Tradesmen then reduced the gap and pulled a desperate splurge out of their hat to finish a third of a length down. UBC and Vancouver RC: Rea, Bodnar, Moran, Allester. Thames Tradesmen: Mallin, Roberts, Milligan, Cusack. The Princess Elizabeth for schools was marred by the exam timetable again, complained the Henley recorder. Why these people who arrange A levels cannot conduct their affairs to avoid the Henley timetable, he couldn’t imagine. There were two selected crews – Holy Spirit High School (U.S.) and Emanuel School from Wandsworth, and they duly met in the final. Holy Spirit beat Hampton and Tabor Academy to get there, and Emanuel disposed of Abingdon and Eton. In the final Holy Spirit led to the Barrier, where Emanuel drew level. Not for long, however. The Americans had half a length at the three quarters signal and drew away at the end to win by two thirds of a length. Holy Spirit HS: McDevitt, Millar, Bibik, Foerster, Guenther, Welsh, White, Brown, cox Maguire. Emanuel School: Tollitt, Ridgley, Lemmens, G. Roberts, Field, Downie, N. Roberts, C. Roberts, cox Upton. The other half of the Tradesmen Grand eight won the Prince Philip for coxed fours by a row-over. Leander, the other finalists, withdrew because they were also rowing in the re-scheduled Grand and refused to contest the Philip before it. So the Philip was a damp squib – not the only one on the Sunday afternoon. With a fork of lightning and a clap of thunder, the weather broke, and all thoughts turned to Montreal. Christopher Dodd’s Pieces of Eight is available from the River & Rowing Museum here and Richard Way Bookseller, 54 Friday Street, Henley-on-Thames or give them a call at INT+44+(0)1491-576663. On two days in the nineties the rule about jackets was relaxed in the Stewards’ Enclosure, although ties were still required and shirts had to stay on in the public enclosure. On the banks it was bikini tops which came off, making paddling up to the start more interesting than usual.